Bienvenido a Hotel Bella Italia Peschiera del Garda. The hotel is in a lovely location, sólo 100 meters from the beach and few minutes far from the center of Peschiera del Garda. It is inserted into the large and vivacious complex of Camping Bella Italy, one of the best resorts of Lake Garda, where you will find fun and freedom with sports activities, entertainment, swimming pools for adults and children, etc.. without renouncing the exclusive services of a 4 star hotel where every detail of your stay will be assisted from our staff! Swimming pools for adults and children with sun beds and beach umbrellas, Jacuzzi, sauna, gimnasio, kid’s play room, garage, parking, etcétera. You will enjoy the peace and relax that our unique services will offer you and your children can play quietly. Our restaurant offers children special menus and the opportunity to book a half or full-board day-by-day or choose from the rich menu a-la-carte. 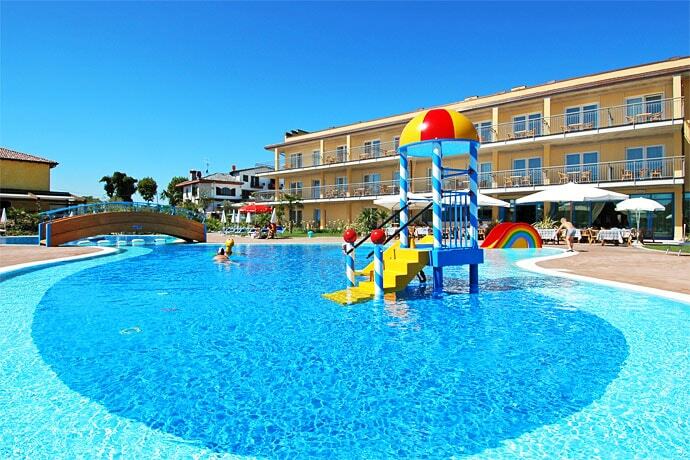 (Hotel Bella Italia Peschiera del Garda hotels).